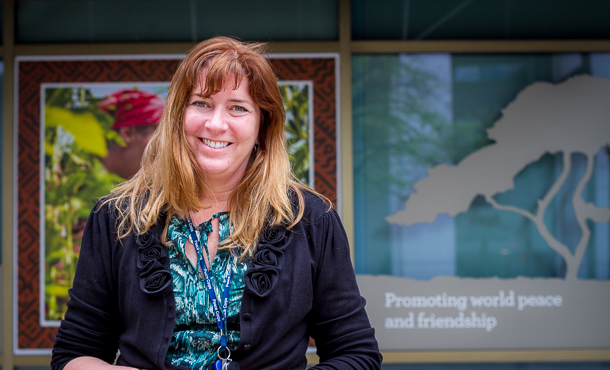 Center for Justice and Peacebuilding alumna Krista Rigalo, a veteran administrator of training and education programs in the Peace Corps, was selected to lead "Let Girls Learn," an initiative that taps the Peace Corps to focus on girls’ education and empowerment. "We know that investing in girls, a moral imperative in and of itself, is a proven catalyst for development,” Rigalo says. That’s not the only partnership the White House has lately touted. In early March, the president and first lady launched “Let Girls Learn,” an initiative that taps the Peace Corps to focus on girls’ education and empowerment. Heading that program is Center for Justice and Peacebuilding alumna Krista Rigalo, a veteran administrator of training and education programs in the Peace Corps. She assumed her duties May 18. She said that Peace Corps volunteers are uniquely placed to work with girls and communities to address barriers to girls’ education. In much of the world, the barriers are numerous and include lack of educational opportunities, lack of funds for school fees, lack of sanitary hygiene products during menstruation, lack of girls’ latrines and lack of local schools. In the first year, the program will target the following countries: Albania, Benin, Burkina Faso, Georgia, Cambodia, Uganda, Ghana, Moldova, Mongolia, Mozambique, Thailand and Togo. Rigalo has long been involved with the Peace Corps, first as a volunteer in the late 1980s and early 1990s, then later as country desk officer, program and training specialist and chief of programming and training for the Africa region. Following service as a Mennonite Central Committee (MCC) volunteer in the eastern Congo, Rigalo came to Eastern Mennonite University to pursue an MA in conflict transformation. She graduated in 2000 and returned to Africa with MCC to work at the Africa Peacebuilding Institute in Zambia. She also worked for MCC in Angola. In 2003, Rigalo entered the doctoral program in conflict analysis and resolution at George Mason University. She began working on the Peace Corps staff in 2005. Under Rigalo, the Peace Corps will recruit and train additional volunteers to focus specifically on girls’ access to education while volunteers already in the field can apply for funds through a newly established girls’ education fund.